"Making the desired impact as a new brand in an unfamiliar market is a significant obstacle. From the beginning, there was no doubt that Polaris would need a strong Internet Marketing Strategy to be successful." This client is no stranger to an elite audience. Polaris Industries is a US based manufacturer of snowmobiles and ATV vehicles.. Polaris India Pvt. Ltd. was established as a wholly owned subsidiary of Polaris Industries Inc. (USA), which designs, engineers, manufactures and markets innovative, high quality Off-Road Vehicles (ORV’s), innovative All-Terrain Vehicles (ATVs), the Polaris RANGER*RZR, (for recreational and utility use), snowmobiles, motorcycles and on-road electric powered vehicles. With annual sales hitting $2.7 billion in 2012, Polaris Industries stands as the world’s foremost manufacturer of Off-Road Vehicles. When Polaris entered the Indian market, their focus was to make a mark amongst the HNI (High Net-Worth Individual) Audience. Making the desired impact as a new brand in an unfamiliar market is a significant obstacle. From the beginning, there was no doubt that Polaris would need a strong Internet marketing strategy to be successful. What Polaris needed was a comprehensive approach to help them penetrate a foreign market, i.e., a blend of social networking activity, aggressive branding and a lead-based marketing approach to ensure success. After they approached Techmagnate, our team conducted a comprehensive study of the brand and set up a complete internet marketing strategy to help them succeed. We also wanted to play up the thrill inherent in adventure sports. To get Polaris where they wanted to be, we recommended a marketing mix to be implemented through Google AdWords, Facebook, LinkedIn and YouTube, which would bring them closer to their audience. Each category was targeted separately keeping in mind the need of the business, using the appropriate themes and ads. As of today, the growing account of Polaris has 12 active campaigns, about 4000 keywords, 400 text ads and about 200 image ads in Google alone. Additionally, new campaigns are constantly launched on Facebook, YouTube, LinkedIn, and Google to help Polaris grow their business. "Beginning March 2012, Polaris' leads grew by over 500% with Cost-Per-Lead (CPL) reduced by 60%. 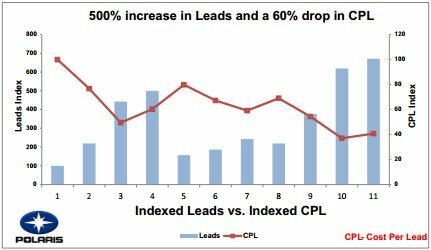 We acquired five times the number of leads at less than half the CPL." Working with Polaris showed us that a concerted effort on multiple channels can achieve ground-breaking results. In a matter of weeks, we began to see astounding numbers vis-a-vis their impressions, clicks and leads, beginning almost immediately from the launch date in March 2012. On a month-to-month basis, Polaris’ leads have increased considerably with the CPL reducing simultaneously. Beginning March 2012, the leads for Polaris grew by over 500% and at the same time, the CPL came down by about 60%. In other words, we were acquiring five times the number of leads at less than half the CPL. 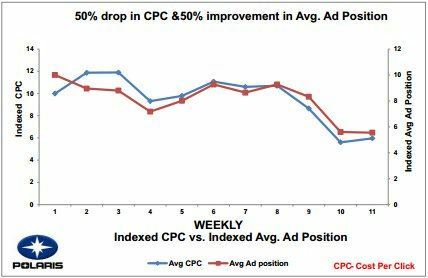 The chart shown on the right demonstrates a drop in the CPCs (Cost-Per-Clicks) for keywords after the commencement of their PPC campaigns. Quite steadily, Polaris began to see a 50% drop in their CPC with a hike in their ad position, moving by 50% as well. As mentioned earlier, Polaris was an unknown name for the India HNI audience. Since demographic research indicated their active presence on YouTube, Techmagnate used this platform to focus exclusively on branding activity. Once again, targeted efforts produced remarkable results, evident in the subsequent volume of customer enquiries. 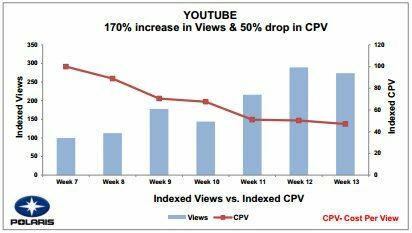 The YouTube campaign which began around April 2012 saw a growth of 170% in the succeeding weeks and a drop of Cost-Per-Views (CPV) by 50%. Similarly, the Likes campaign on Facebook has also helped in the overall branding and business growth of Polaris. 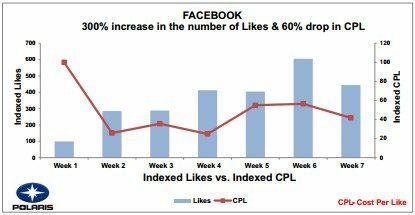 The numbers of Likes through the Facebook like campaign grew by nearly 300% and at the same time saw a drop of over 60% in the CPL. Higher traffic to the website. A consistently increasing number of leads. Significant drop in the CPLs and CPCs. We were able to achieve the results above because at all times our focus remained constantly on implementing a targeted strategy for each audience segment.